Rabbi Avraham Yeshaya(hu) Karelitz s.z.l. The city of Bnei Brak in central Israel, adjacent to Tel Aviv, is known for its traditional, religious population. 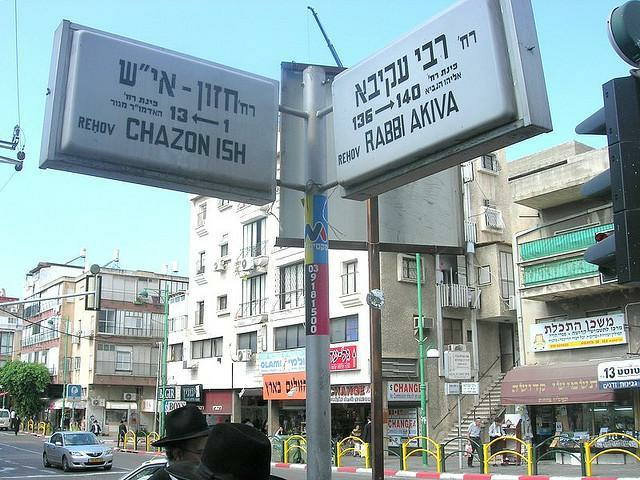 Once it was a quiet town, a city full of Jewish learning and Yeshivoth (Torah High Schools), a city in which no traffic could be seen on Shabbat and where attention was paid to Ma´asim Tovim (good deeds), righteousness and piety. Since the founding of the city in 1923 C.E. it was thus and it is still like this today. During the first half of the 20th century C.E. a veritable pilgrimage started and swelled to the most Orthodox quarter of Bnei Brak, Zichron Me´ir, consisting of men, women and even children from all walks of life, and all parts of the world. One inhabitant, in a small house on the edge of this pious quarter, was the magnetic attraction of the pilgrimage. Hundreds of people, the elderly and the young, the religious and non-religious, Rabbis and Sages, judges and labourers, continued their pilgrimage along a narrow path that led them from the country lane to this small house. Some came on horse or on a donkey, others came in rich limousines, still others in simple vehicles, but most came on foot. They all however came with a similar intent: the longing for a mentor and a spiritual guide in life, searching for an answer to a halachic or life problem that preoccupied or worried them. Even the very first Prime Minister of Israel, David Ben-Gurion (1886-1973 C.E.) was one of those who came for a consultation. He also sought the advice of the mysterious and famous Sage living in the small house, on issues of state and religion in modern Israel, so as to be able to take important decisions. Who was this extraordinary personality in Bnei Brak who was the focus of so much interest and created such an epicentre of pastoral advise? It is a historical and documented fact to be found in many biographical books on the Chazon Ish, that most of those who entered the house of this Sage, fearful or worried, left the house self-assured and spirited, with an expression of hope and trust on their faces. Who was this Torah figure who, with his penetrating gaze and far-reaching words, could drive away the sadness and fear of these seekers of council and turn them into harmony and satisfaction? His life and how he came to this universal prominence and reverence within religious Judaism, is the subject we wish to highlight in this essay. Rabbi Avraham Yeshaya(hu) Karelitz s.z.l., known to the halachic world as Vision of Man, was born in 1879 C.E. in the small town of Kossova or Kosava (known these days as Brest Voblast in Bellarus) in the neighbourhood of the big Jewish Talmud citadel of Vilnius (Vilna), the capital of Lithuania. He was blessed with an intellect characteristic of genius, talmudic “Ilui”, a brilliant youngster with an excellent photographic memory. In his younger years it did not take long till no talmudic teacher could be found who was capable of teaching him in his birthplace Kosova. His father, Rabbi Shmaryah(u) Yoseph Karelitz, the chairman of the local Beth Din (Rabbinic court), decided to educate this talented son himself. Around the time of his Bar Mitzvah, his religious adulthood at age 13 (for boys), the young man Avraham Yeshaya(hu) was already a qualified Talmud Sage. During the meeting of leaders and members of the Jewish community of Kosova for his Bar Mitzvah celebration, the young Avraham Yeshaya(hu) publicly promised to devote his entire life to studying Torah, without any ulterior motives to gain a Rabbinic position or a position in a Rabbinic court. He remained true to his word of honour during the rest of his life. He married Bashe (Batya) Bei, the daughter of those who loved Torah and he learned day and night, while his wife took care of their livelihood. Their daily life was far from comfortable with the meagre income from a small shop in textiles. When the young scholar was too tired to study Torah or write Torah-Novellae (Chidushim), he energetically helped his wife, till late at night, with the accounts of the shop and with keeping the client accounts up to date. The couple was not blessed with any children, despite many childless couples later coming to the Chazon Ish with a request for a blessing for children, and with these requests granted. The young Rabbi Avraham Yeshaya(hu) Karelitz was a self-taught man who tended towards solitude and anonymity. His Torah-Novellae and new interpretations of the Torah were published under the penname of Ta Shma (the meaning will be explained in the next paragraph) in Knesset Yisrael (Gathering of Israel), a monthly Rabbinic magazine for scholars concerned with halakhic and talmudic subjects. 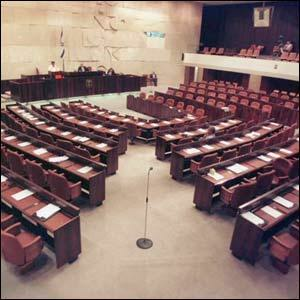 Knesset Yisrael was published in Vilna and widely circulated. 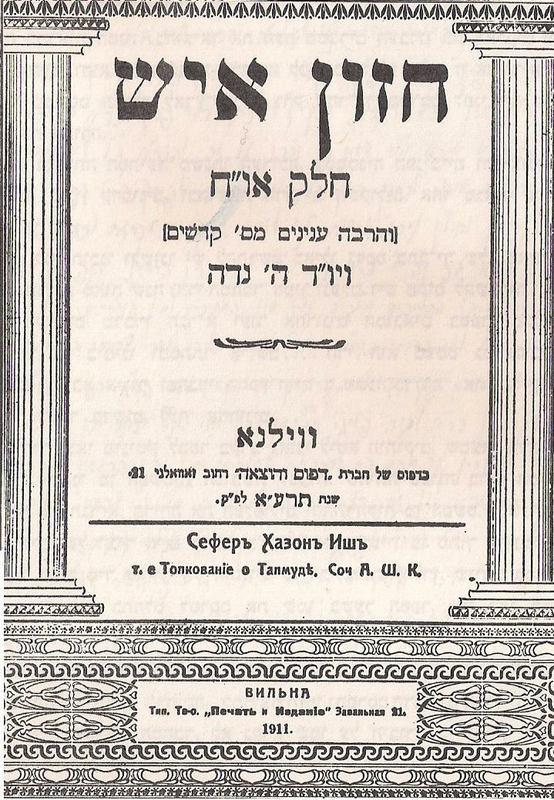 Rabbi Avraham Yeshaya(hu) Karelitz chose to write under the penname of Ta Shma, the classical concept for solutions for talmudic and halachic problems. His halachic positions and published new Talmud interpretations were always very well thought through and concisely written. The anonymous identity of Rabbi Avraham Yeshaya(hu) Karelitz was soon discovered by the last Chief Rabbi of Vilna, the world famous Rabbi Chaim Ozer Grodzinsky (1863-1940 C.E.). During the First World War (1914-1918 C.E.) the economy in Kosova was so bad that Rabbi Avraham Yeshaya(hu) Karelitz and his wife were forced to move to Vilna. From then on the Chief Rabbi of Vilna Rabbi Chaim Ozer Grodzinsky, constantly sought the advise of the young Rabbinic genius. On important issues Chief Rabbi Chaim Ozer would first seek the position of Rabbi Avraham Yeshaya(hu) Karelitz before taking a decision himself. 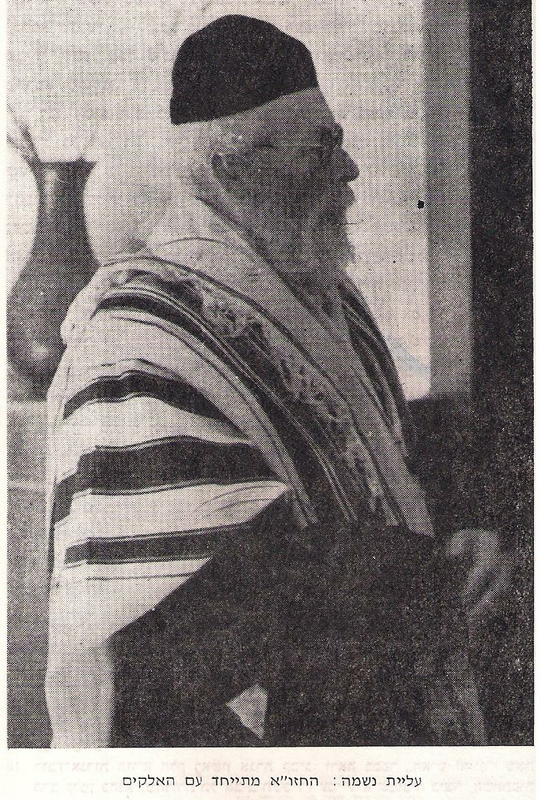 Rabbi Moshe Blau (1885-1946 C.E. 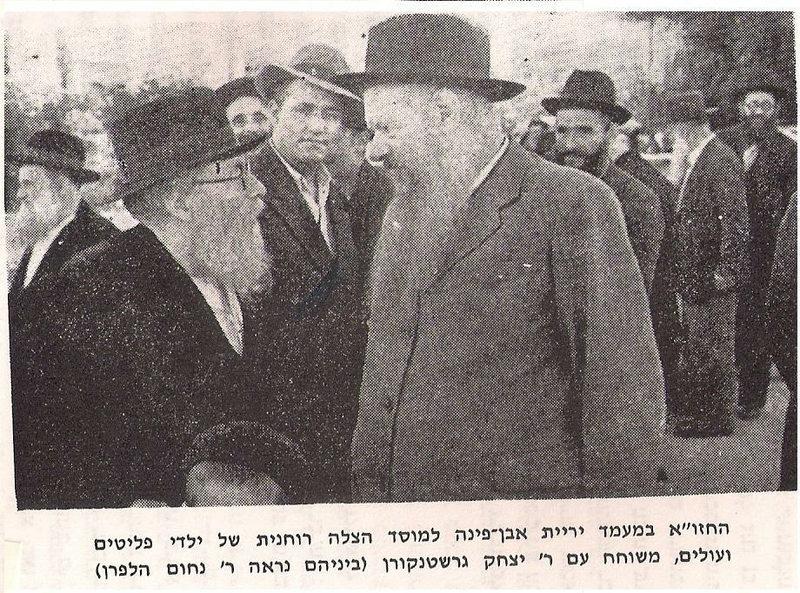 ), one of the most important founders of Agudath Yisrael, a religious umbrella organisation of Torah-faithful Jewry from Eretz Yisrael, the erstwhile Palestine, paid a visit to the Chief Rabbi of Vilna during the 1920s. Rabbi Chaim Ozer Grodzinsky asked his secretary to show the visitor the main attractions of the city of Vilna. 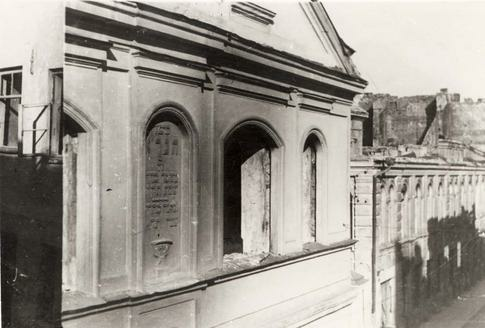 The secretary spent several hours visiting the city, the synagogues hundreds of years old, the world famous Jewish cemetery where great Jewish Sages like the “Vilna Gaon” (1720-1797 C.E.) found their place of rest. The secretary showed the visitor from Eretz Yisrael the famous Rabbinic library of Rabbi Shmuel Strashun (1794-1872 C.E.) with its rich collection of rare religious books and manuscripts and also many other sights of historical importance. 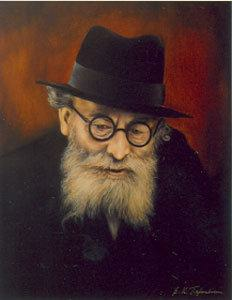 The Chazon Ish was unique in everything he did, but also in his method of learning. While other scholars would be very proud of the fact that they could study the enormous study assignment of sixty or more pages of Talmud on one day, he was often busy with one single page of Talmud for four days or more, until he was satisfied and understood in detail everything that he had thoroughly investigated and learned. 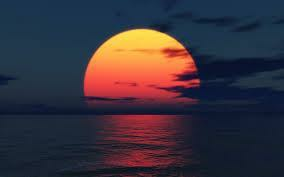 Once he immersed himself for four months, for fifteen hours each day, in one single Tractate of the Mishnah. Apart from Torah and Talmud he also studied general and profane subjects like anatomy, astronomy and agriculture, because a thorough knowledge of these subjects is required for a complete insight into several aspects of Jewish Law and practise in these fields. His example in this method of study was the “Gaon of Vilna” (1720-1797 C.E.). He distinguished himself from other Torah scholars also in his method of learning outwardly. He learned in a silent and discrete manner. He also did not rhythmically sway his body (shockeln in Yiddish) while studying Torah. Rather, his mind and body were concentrated as one on the Torah subject that preoccupied him and this remained the case until he was satisfied and had found the correct interpretation. Then his face showed a harmonious and satisfied expressions, a sign to his family that he had solved the umpteenth difficult problem. The more he went out of his way to hide his true identity and remain anonymous to the Jewish scholarly world, the more famous he became and the more his advice was sought. 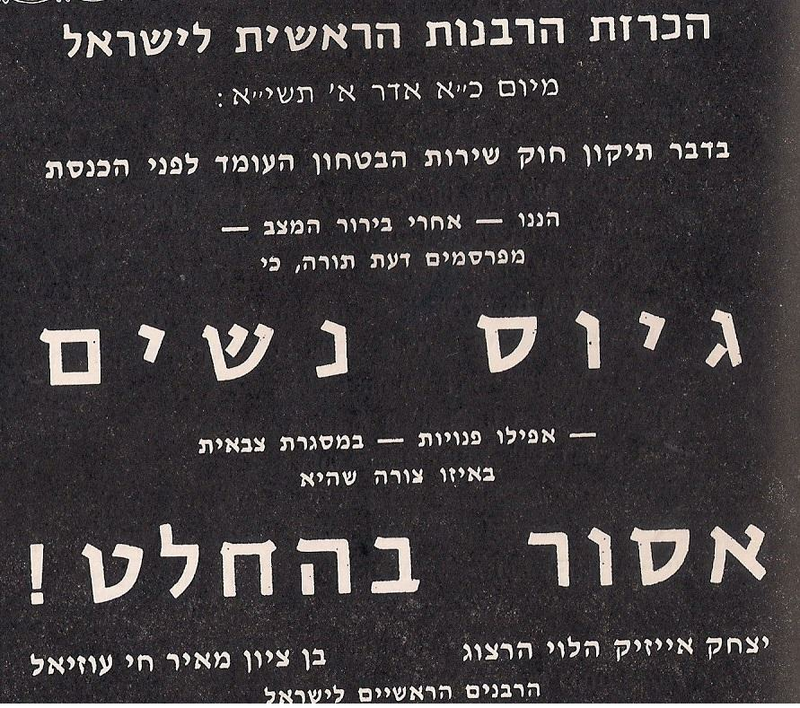 The first imprint of the work Chazon Ish in Vilna, 1911 C.E. 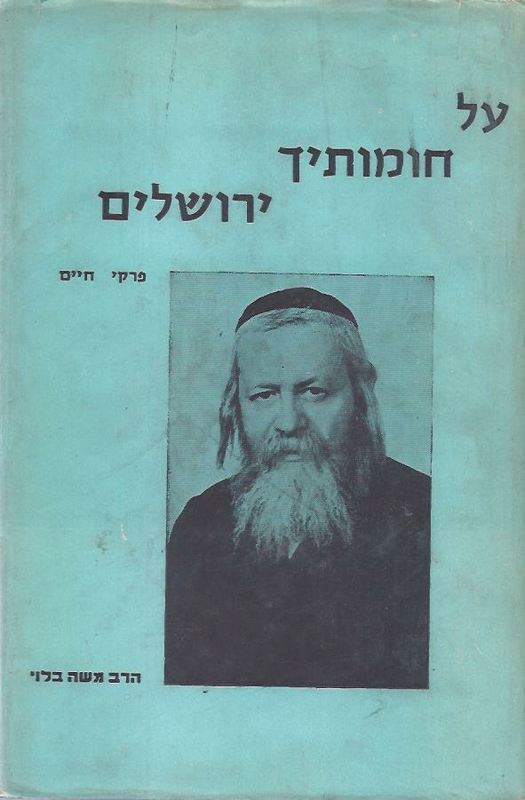 Were it not for the fact that he mentioned the “Gaon of Vilna” and contemporaries like the Chafetz Chaim in his works, one could be of the opinion that the author of his works was an early Tossafist (from the school of Rashi) from France, who lived about eight hundred years earlier. A good example of this occurred during the First World War (1914-1918 C.E. ), when the Chafetz Chaim (1838-1933 C.E.) 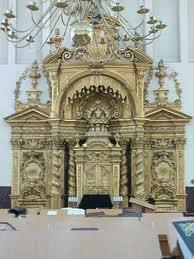 was stranded in Russia and could not return to his Yeshiva and house in Radin, Poland. 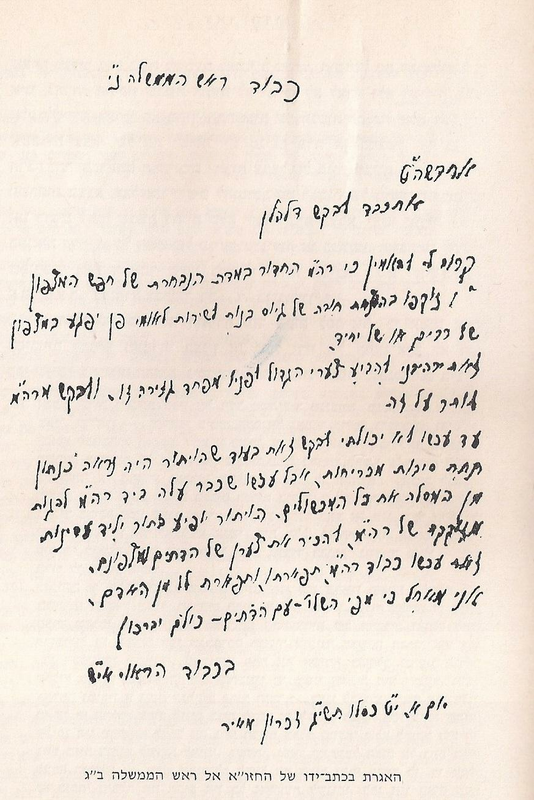 The Chafetz Chaim sent an express letter to his fried Chief Rabbi Chaim Ozer Grodzinsky of Vilna (1863-1940 C.E.) 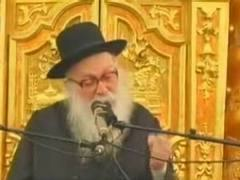 to ask him to use his influence to obtain a visa for the Chafetz Chaim to enter Lithuania. The Chafetz Chaim further insisted on mentioning that it concerned a matter of life and death. The letter reached its destination on the Eve of Shabbat and Chief Rabbi Chaim Ozer Grodzinsky decided to send a emissary to Warsaw, the Polish capital, as soon as Shabbat would end the next evening. That Shabbat, the Chazon Ish sat silently in his corner listening to everything that was said about the desperate letter. 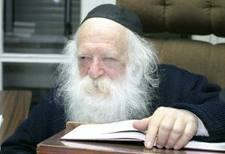 In the end he remarked: “I do not understand the course of action of Rabbi Chaim Ozer Grodzinsky”. The Chafetz Chaim himself wrote in his very well known work Mishnah Berurah, that, where it concerns a matter of life and death, the Laws of Shabbat are not applied. Had he not written in his letter that in this case it concerned such a matter? 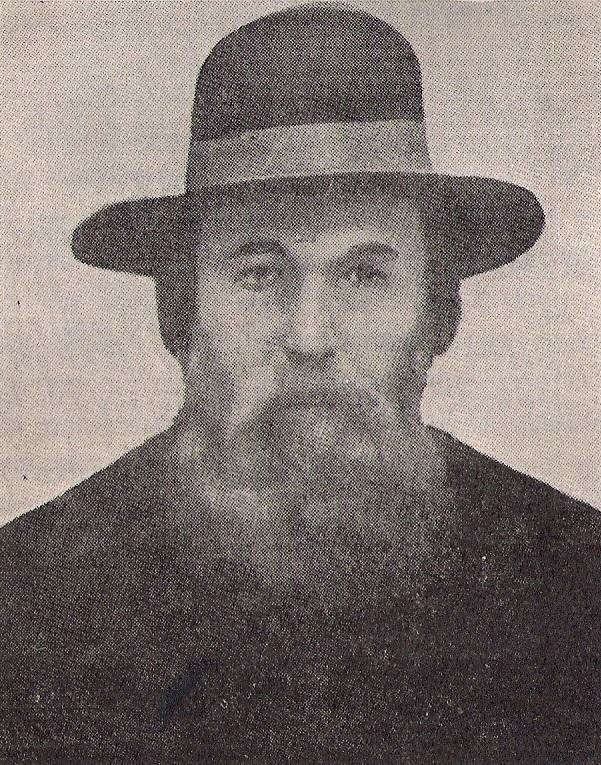 Rabbi Chaim Ozer Grodzinsky did not hesitate and immediately sent an emissary to Warsaw to negotiate with the Polish authorities to issue an entry visa for the Chafetz Chaim, even though it was still Shabbat. In those pre-Shoah times Rabbi Avraham Yeshaya(hu) was known as a very competent authority in Halachah. When he made known his desire to settle in the Holy Land, the leading talmudic and halachic authorities of Vilna tried to dissuade him. They did not want the Chazon Ish to leave them. They could however not convince him, he so longed for Eretz Yisrael. In an introductory letter to the scholars of Yerushalayim/Jerusalem and the Holy Land it was written: “A lion among the Sages is leaving Lithuania to settle in Eretz Yisrael”. Once, when an American tourist came to see him for a blessing and advise, the first question the Chazon Ish asked this man was: “Have you come to settle?” “No, I came as a tourist, to see the sights of the country”, the American Jew replied. “How is it possible”, the Chazon Ish once remarked, “that a scholar or Rabbi who has been brought up with Tenach (the Hebrew Bible), and who studied Chumash (Hebrew for the first five books of the Hebrew Bible), does not overflow with a boundless love and deep affection for the Holy Land? What has he learned from the Torah? The Torah teaches him about Moshe Rabbeinu (Mozes Our Teacher), the father of all Prophets, the inimitable and unique leader who succeeded in freeing the Israelites from Egypt and leading them to Har Sinai/Mount Sinai, to receive the Torah. When Rabbi Avraham Yeshaya(hu) arrived in Eretz Yisrael in 1933, he lived together with his wife in a room near the coast of Tel Aviv. No one knew his identity. Later on he moved to Bnei Brak, to the heart of the new Yishuv (religious population centre) that was being built at that time. The Chazon Ish did not preach for the sake of preaching. Whatever he set himself as a task, he succeeded at. 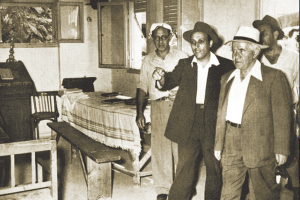 He was always actively busy wherever he could, as in visiting and encouraging the new religious immigrants who settled in the neighbourhood of Bnei Brak. His special love however went out to the Torah faithful Jewish young men and women who took part in the ideal of the agricultural life and greening of the Land. The Chazon Ish regularly visited their settlements and Kibbutzim. He stimulated and influenced them in the great, idealistic work they undertook and taught them the Halachah and Mitzvoth concerning agriculture specific to the Holy Land. 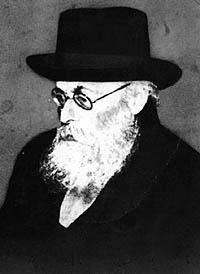 For the religious farmers bound by Torah the Chazon Ish established the Shemitah Fund, so that they would have enough income to live from during the Shemitah year (the seventh year in the cycle when the land had to lie fallow and also for the first of the new cycle, when everything had to start from scratch). “Be disappointed, be bitter”, he said, “but never be depressed. You must always be prepared for setbacks, nothing has ever been achieved without a struggle. Bitterness and disillusionment will disappear and success will eventually be achieved. However, if one is depressed, prosperity will never be achieved.” The Chazon Ish was always set on helping, not only with advise and guidance, but very often also financially. He was always ready and willing to help support a new religious project, like the building of a Mikvah (ritual bath), a Talmud-Torah (school for younger children) or a Yeshiva (Torah High School). He was the initiator of many of these pioneering projects and his energy and enthusiasm inspired others to realise his plans efficiently and speedily. It is not an exaggeration to declare that the Chazon Ish was the most authoritative, halachic resort during the last generations. Even the Israeli Court of Appeal and Supreme Court took his halachic decisions, analyses and expert opinions on all questions of Jewish religious Tradition and Law into consideration. His advise and opinions were followed by Torah-faithful Jews and Rabbinic circles from across the world, as is still the case today. During the persecutions of the Shoah, when a relatively large group of Yeshivah and Torah scholars from Lithuania and Poland could flee from the European inferno to Shanghai in China, to find asylum there, the question was raised when Shabbat and Yom Kippur began. Because of the big time difference between Eretz Yisrael and Yerushalayim/Jerusalem and the Far East, the refugees were not certain at which time they should observe Shabbat and Yom Kippur. The halachic decision of the Chazon Ish, that one should consider geographic time differences, was accepted because he had a profound knowledge of astronomy. He was the highest authority on Halakhah in his day. Every problem or question presented to him was weighed on the scale of Halakhah and logic. He would spend days thinking about the solution to a question, until he was satisfied with his decision and it could no longer be refuted. Still, despite the many halachic and religious-social problems that preoccupied him, his house remained open to everyone who wanted to see and consult him. His front door was never locked and even when he badly needed to rest, he refused to limit the visiting hours or to tell pilgrims to leave. Not all those seeking his council came in dire straights. 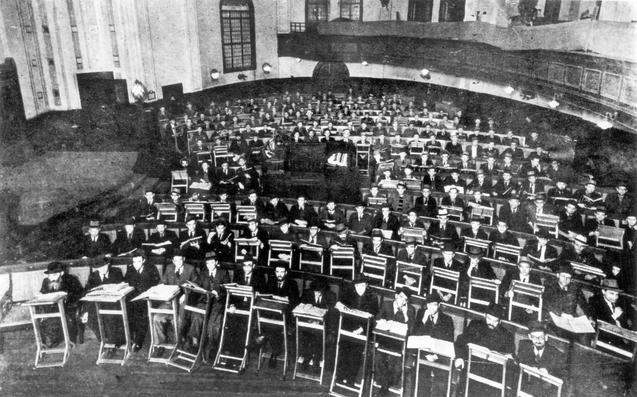 Many were industrialists, manufacturers, traders or entrepreneurs who came to consult the Chazon Ish on their business dealings or disputes with colleagues. He listened attentively to everything they had to say and his opinion was based on Halakhah, logic and contract. Also for mundane, simple issues his position was requested and accepted with understanding. 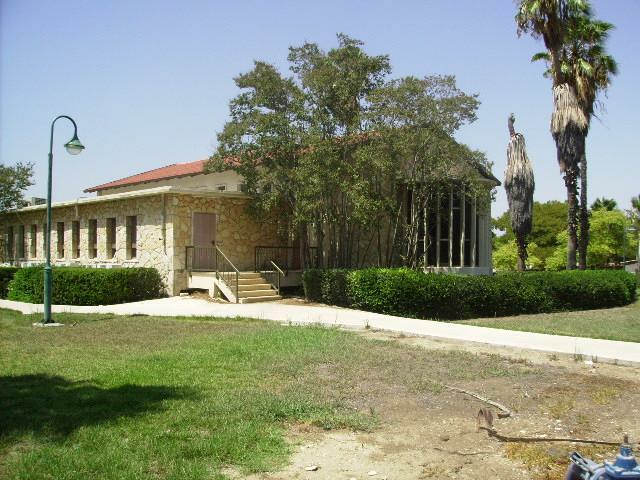 A religious American-Jewish admirer built him a simple house, with its own Mikvah, on a hill in the neighbourhood of the Zichron Me´ir quarter of Bnei Brak. This area is known as the most pious quarter of Bnei Brak. It was planned as a surprise and the Chazon Ish had absolutely no idea of it until he received the key and was asked to go and live there. He immediately refused the gift and did not want to live there, until the generous initiator consented to a reasonable rent. 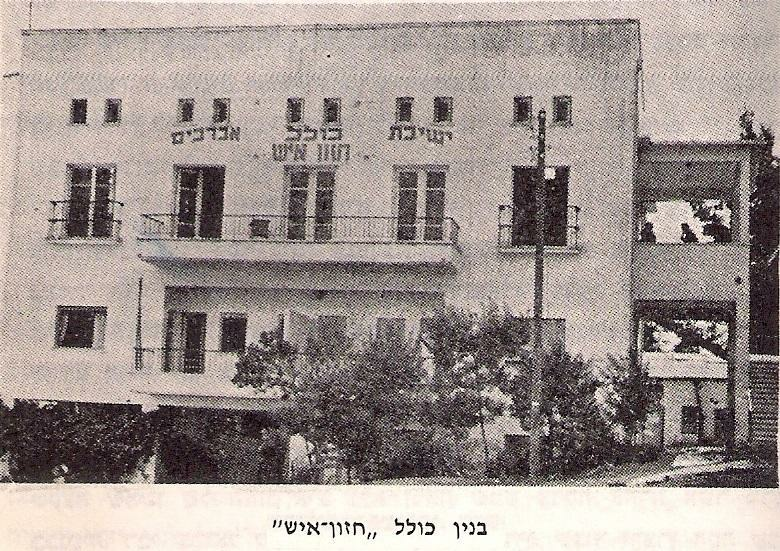 The house of the Chazon Ish was furnished in a Spartan way and after his death the house was converted into a Talmud Torah school for very religious children. 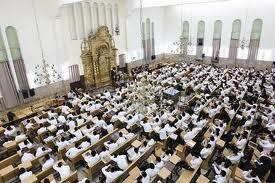 This school still exists today and thousands of children take their first steps in the learning of Torah there. He himself was generous with his gifts and assistance. 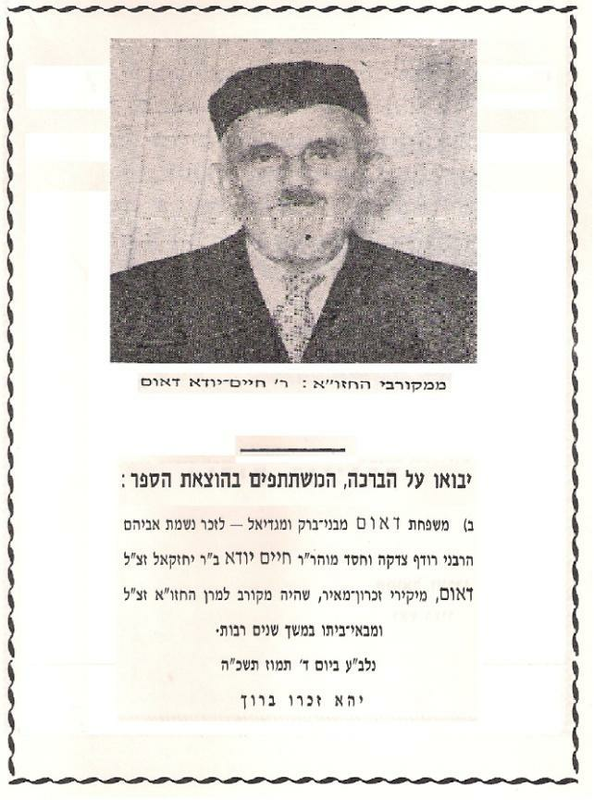 My grandfather, Rabbi Chaim Yuda Daum s.z.l. (1889-1965 C.E. ), who was his personal Gabbai (assistant) and took care of all matters concerning Tzedakah, told us that the Chazon Ish occupied himself with some hundred couples wanting to marry and financed their weddings himself. From my own father, Rabbi Shmuel Yosef Daum s.z.l. (1924-2003 C.E.) I often heard that the Chazon Ish anonymously relieved worthy Torah scholars of their financial worries so that they could continue to study. He even had comfortable lodgings built for them. He supported many Yeshivoth and higher Torah institutes (Kollel) when the means from other sources proved insufficient. He himself lived very modestly and he lacked many conveniences, which, without his generosity, he could easily have afforded. Rabbi Avraham Yeshaya(hu) earned his living from the sale of his publicised halachic works and sold his well known halachic books for two Israeli pound a piece. Whenever someone tried to pay more than this price, the Chazon Ish indignantly gave back the difference. With such large wealth of wisdom it was not surprising that his hometown Bnei Brak was flooded with pilgrims from the four corners of the globe to see this great Tzaddik and Man of Wisdom. It is also not surprising that, when he passed away in 1954 C.E., his burial ceremony was described as not before seen in Israel. Tens of thousands followed the cortege and thousands more mourned in their homes because of the loss of one of Israel’s great spiritual Torah princes. The Chazon Ish at a moment of great concentration during davvennen (praying). It is notable that the Chazon Ish stands like a soldier before his commander, without shockeln (swaying). This cannot be compare to Chassidim who shockeln to all four sides, to aid concentration. 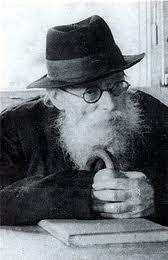 I was three years old when the Chazon Ish passed on to a better, eternal world. Our family lived very close to the house of the Chazon Ish. In fact, we lived in the same street, about 200 meters on. 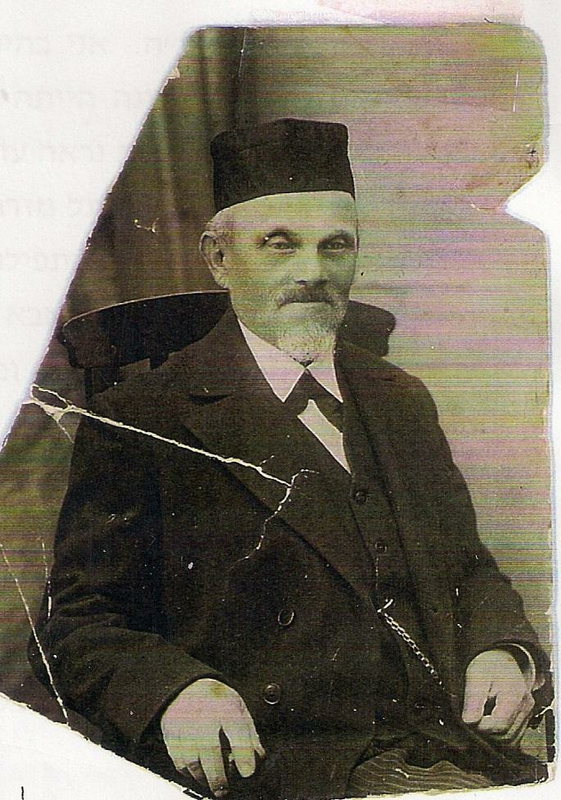 My grandfather, parents and the rest of the family were closely connected to the Chazon Ish. 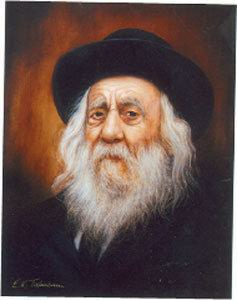 My grandfather, Rabbi Chaim Yuda Daum s.z.l. (1889-1965 C.E. 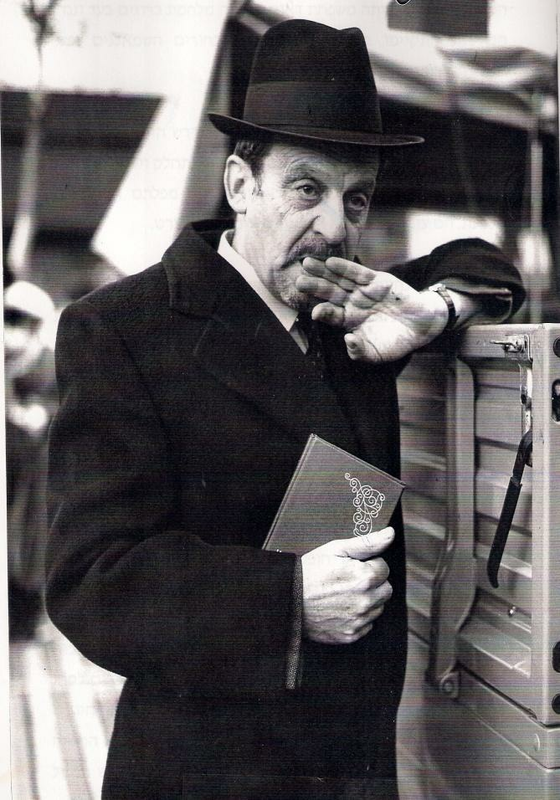 ), was born in Kalisch, Poland and spent his younger years in famous Yeshivoth. He was a Shochet and Chazan, but above all he was infused with a limitless love of and diligence for studying Torah and for Torah scholars. As a refugee for the Nazi barbarity, he left everything in burning Europe and chose to live in the religious town of Bnei Brak, so as to educate his children in the Jewish religious way. I am sure I inherited my love of Torah from my grandfather. 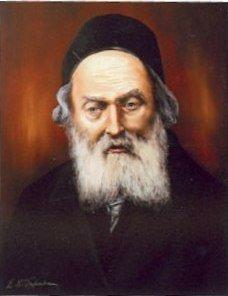 “Sabba” (grandfather) Rabbi Chaim Yuda Daum s.z.l. was one of those trusted men who always had free access to the Chazon Ish. 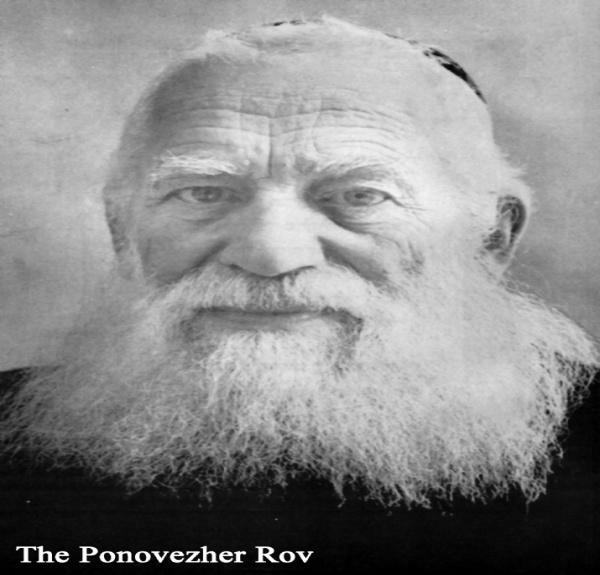 He was the confidant of the Chazon Ish for all matters concerning Tzedakah. Many are the stories told me by my “Abba” of the special and mostly anonymous Tzedakah assignments that my grandfather completed at the instruction of the Chazon Ish. 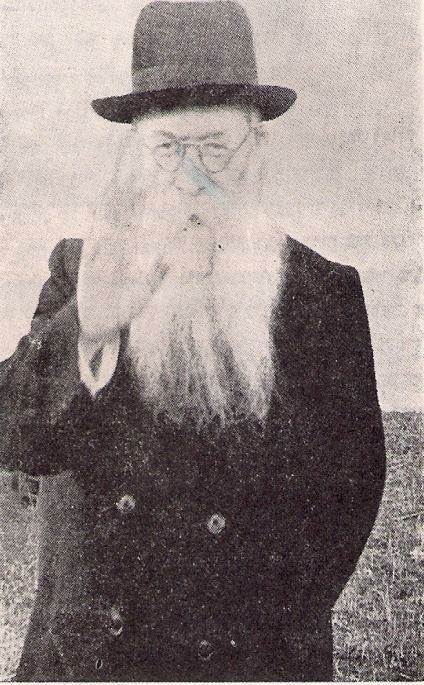 The motto of Chazon Ish was ´anonymous and discrete´, so that the recipient did not know from whom he was receiving the Tzedakah. 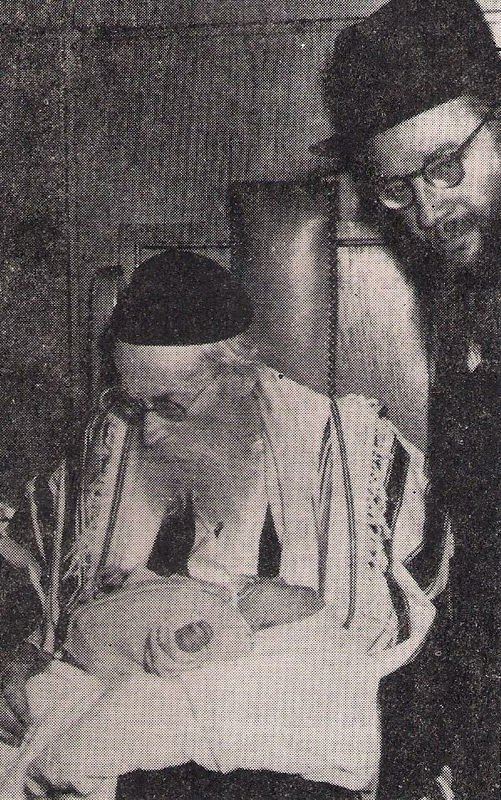 The Chazon Ish especially set high standards in the fulfilment of Mitzvoth. In general one can state that he chose to perform the Mitzvoth at the halachically highest standard, for himself as well as for his followers. Obviously, the electrical light for Shabbat was put on before Shabbat. According to Chazon Ish it is not legitimate to derive enjoyment from such electrical light within the State of Israel, because non-religious Jews who work in the electricity plants, desecrate the Shabbat, willingly or unwillingly. As a consequence, the Chazon Ish never used electrical light, but he had his own generator or he used a petroleum lamp. This practice is still adopted by his followers. To be able to practice Mitzvoth in the best possible halachic manner, the Chazon Ish introduced higher halachic standards for measurements like among others Kezajit. He based himself on his incredible knowledge of the complete Rabbinic halachic literature, which was phenomenal. It is of practical importance to know the minimum measures for the Zitzit garment, for a cup of wine, for the eating of Matzah on Seder night to fulfil the obligation of Matzah, etc. 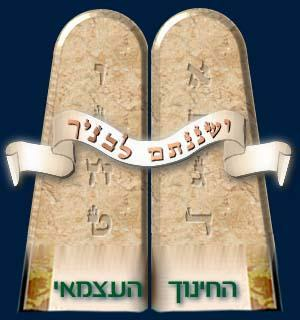 The general ideal of Judaism and its most important Mitzvah, is studying Torah. Obviously, one cannot chose to be a Jewish person and practice Mitzvoth according to Halachah, if one does not know Halachah and Torah. 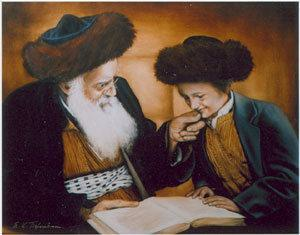 Thus one cannot transmit the rich tradition of the Jewish People to the next generation if one does not know it. 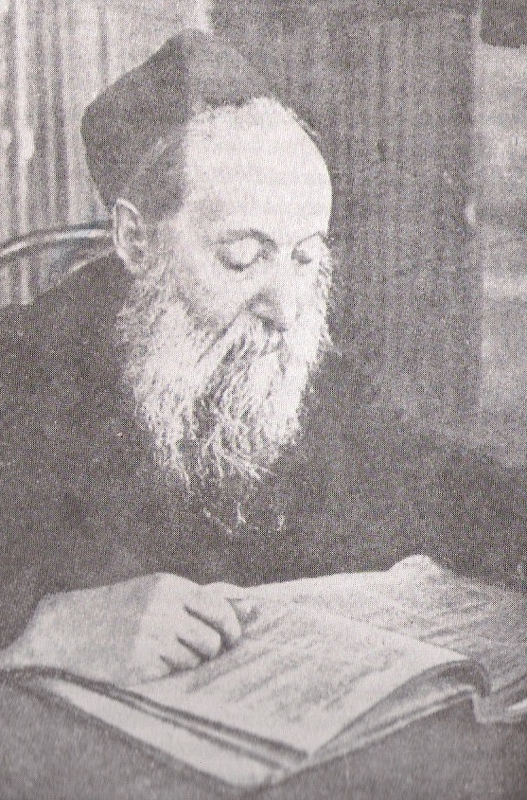 The Chazon Ish bases himself on Maimonides in his description of his ideal of studying Torah. Maimonides describes the Levites and mentions that the Levites and Priests are the servants of G´d because they have no share in the Land of Israel, but that G´d is their portion. Maimonides expands this understanding of the position of the Levites to all people who dedicate their lives to studying Torah. Before the catastrophe of the Shoah, Torah institutes for married men, who spent their lives only in studying Torah, were established. 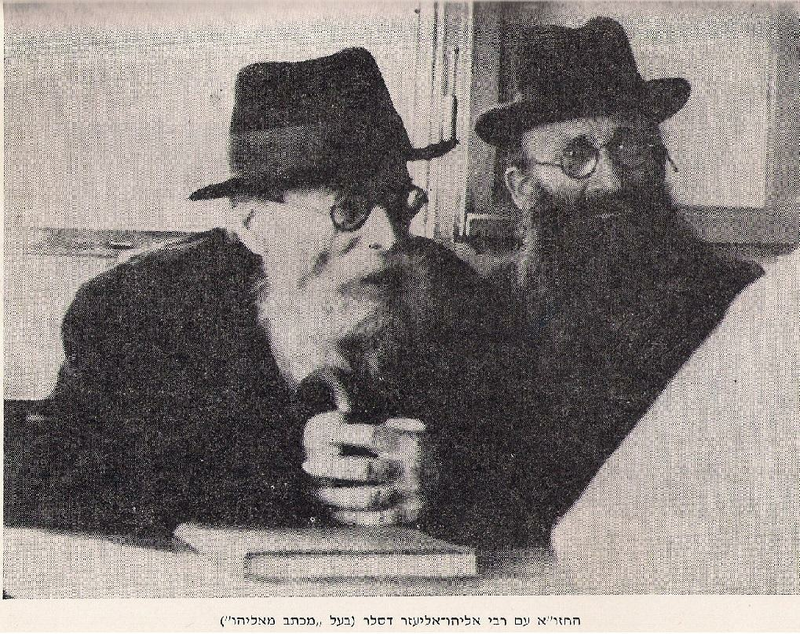 After the loss of the citadels of Talmud and Torah learning in Eastern Europe as a consequence of the Shoah, the Chazon Ish saw the necessity of recuperating the loss by introducing the Kollel. This means fulltime Torah study, during the entire life of a married man. 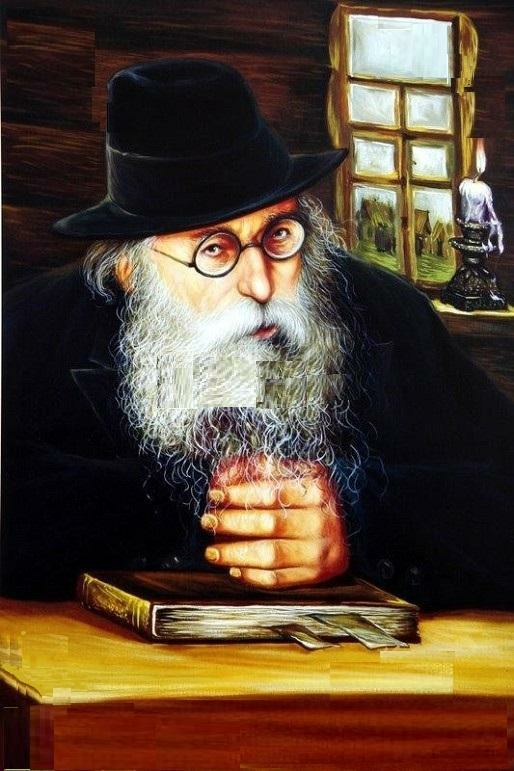 The inspiration of the Chazon Ish took such deep root, that these days in Israel, and worldwide as well, hundreds of Kollelim have been established, where married men study Torah fulltime, for life, for the ideal goal of, in the words of the Prophet Yeshyayahu/Isaiah ”.. and all your children are scholars of G´d…”. These idealists in the field of Torah study have done much to spread the study of Torah in Israel and worldwide. This up to a point in Jewish history, where never before so much Torah study, both quantitatively as qualitatively, has been achieved as these days. These idealists in Torah study live off a small pension to which the wider religious community contributes. Their partners, the wives, are the workers who earn a living for the family. The modern State of Israel has confronted religious Judaism with the issue of military service for women and whether this is halachically permissible. During the long history of Israel, including the period of Tenach and the times of the Maccabees, we can find no noteworthy examples of women serving in the army. The Prophetess Devorah did however encourage Barak, the general of Israel, in the battles with the Canaanites, but she did not participate actively in the war herself. Yael, a non-Jewish woman who killed Sisera, the general of the Canaanites, however did. Judith, from the circle of the Chasmoneans-Maccabees, beheaded the Greek general Holofernes in his sleep (164 B.C.E.) in extraordinary circumstances. Halachically army service for women could be considered as women wearing clothes and weapons meant for men. This is halachically prohibited, as women are not permitted to wear trousers or to carry weapons, because they are typically pieces of clothing or defence items for men. Another argument against military service for women is based on Tehillim/Psalm 45:14 …(as well as) every honourable princess dwelling within, whose raiment is of golden settings -… . From this the Rabbis understood that the place of the woman is in the home as a wife and mother and not in the army or on the battlefield. The modern profane State of Israel has suggested that women can also contribute to the army and thus strengthen the defence of the State of Israel. During this controversy, all halachic Authorities, including national religious Rabbis like the Chief Rabbinate of Israel, have come out against military service for women. Besides the halachic prohibition, another major objection concerns moral and ethical integrity, namely that young women can become demoralised and be influenced by immoral behaviour through military service and can abandon religious Judaism. Chazon Ish succeeded in persuading the then time Prime Minister David Ben-Gurion to free religious young women from active military service on their request. This leniency still exists. National religious circles like Mizrachi and others have a national service for young women during which they volunteer as nurse or teacher or work to integrate new immigrants. As stated, Torah learning is the ideal in Judaism. For realising this ideal, no other institute can equal the millennia old Yeshivoth and Torah academies. Without these high schools for studying Torah, religious Judaism would have ceased to exist a long time ago. It is in these schools where the famous two Talmudim, the Babylonian and Jerusalem, came into being. During the course of the past two thousand years, a limitless amount of Torah-Novellae, new ideas, arose within the walls of the Yeshivoth. Since biblical times the Levites and Priests, were, as servants of G´d , exempt from military service. The Talmud also teaches that Torah scholars were exempt from military service and taxes. Even in Christian Europe priests and theology students were exempt from military service so as to perform a divine service. Along these lines, the idea and thesis developed in the Talmud and Jewish Code of Law Shulchan Aruch, that Torah scholars and their followers are exempt from military service because their service to G´d is equal to military service. Morally and ethically, Judaism underscores, that without active Torah study and Yeshivoth, creation and the People of Israel would not exist. This is based on Yermiyahu/Jeremiah 33:25. The profane State of Israel wanted all young men from the age of 18 and upward (till at least 50) to perform military service, to contribute to the national defence of the Jewish State. This wish was fervently countered by religious and halachic Authorities. The idea that young Yeshivoth students would not be exempt, was rejected by them on the following grounds. a. 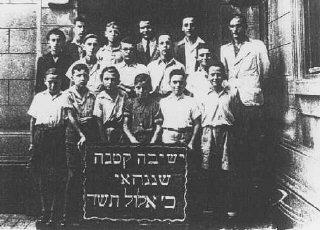 During the long Jewish history there has never been a compulsory military service for Torah students. b. To force religious Jewish men to perform military service, would be an existential threat to Yeshivoth and would probably mean the end of the great Yeshivoth tradition. c. The moral integration of the religious young men with the a-religious men during military service is questionable and will probably cause these religious young men to abandon religious Judaism. d. Yeshiva student also contribute to the defence of the Jewish State of Israel by studying Torah, because in and of itself learning Torah protects the State of Israel according to the Tradition. 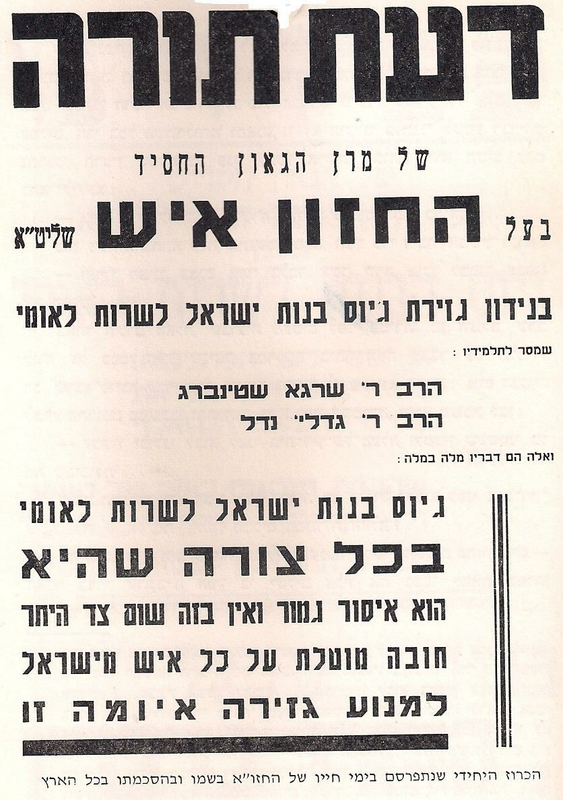 Chazon Ish reached a agreement with Prime Minister David Ben-Gurion, that all those whose fulltime occupation is studying Torah and all Yeshivoth students will be exempt from military service, as long as they are occupied fulltime in the study of Torah. This decision is still current. Every Knesset (Israeli Parliament) has tried to modify this rule, without success, because nearly every Israeli government needs the support of the Charedi (Ultra-Orthodox) religious parties to be able to form a coalition. 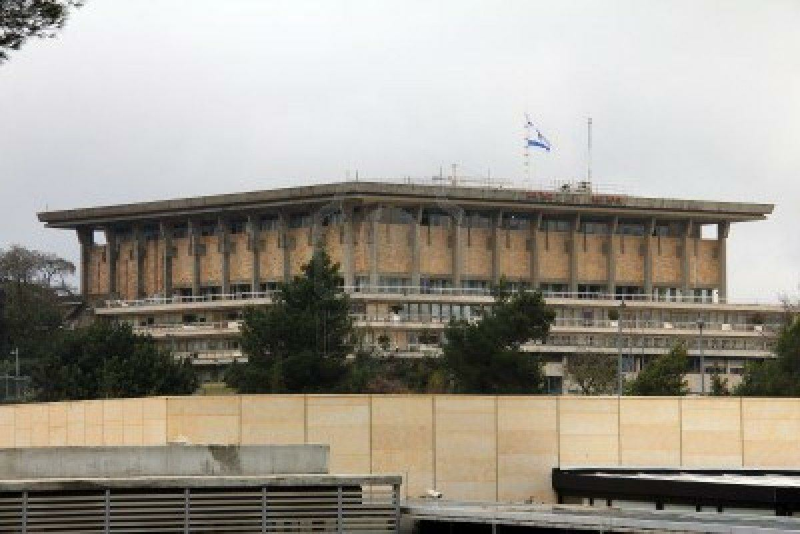 In the currant Knesset (2013 C.E.) the issue is again much disputed. It is striking that Mizrachi circles (national religious parties in Israel) have instituted a sort of military service in combination with Yeshiva studies, named Nahal. Young men serve in a military, religious unit and at the same time spend a large part of their service in Yeshivoth. This service lasts five years in stead of the customary three years. However, this model has been categorically rejected by Orthodox and Ultra-Orthodox circles for the reasons cited above. The modern State of Israel is, as a non-halachic state, historically seen, certainly not the millennia old dream of Torah-faithful Judaism. The reason for this is that for most religious Jews, the realisation of a Jewish State only becomes an issue when this State is governed according to halachic guidelines and norms, both politically and socially. Examples are: no traffic (both private and public) on Shabbat and Feast days, only kosher food in foods and restaurants, religious education for the young, military service according to the halachic norms, etc. Seen from this perspective, the strong resistance to a-religious and even antireligious Zionism, can easily be understood. This sort of Zionism was dominant in the 19th and 20th centuries. Nearly all religious Orthodox factions in Easter- and Western Europe were categorically opposed to a Jewish State in Eretz Yisrael which does not fulfil the ideals and concepts of the Prophets and Sages. As a consequence of the Shoah in Europe and the loss of religious centres in Eastern-Europe, a marked ideological split emerged vis-à-vis the State of Israel within religious Judaism, with the establishment of the State of Israel under David Ben-Gurion, out of modern Zionism. At one extreme of the spectrum was the small splinter group under the leadership of the Satmar Chassidic dynasty, called Netouré Karta (the true, loyal guardians of the city of Yerushalayim/Jerusalem), which demanded the total negation of the State of Israel, with all its institutions and their following. Examples of the consequences of this attitude are the prohibition of taking part in Israeli elections for the Knesset, the prohibition on forming religious parties or engaging in Israeli politics, the refusal to accept financial support by the modern State of Israel for Yeshivoth and social services, the prohibition of speaking Ivrit (Yiddish is permitted). With these measures, these small groups wanted to remain independent of the State of Israel. On the other side of the spectrum, the majority of the religious Orthodox Jews, with the recommendation by the Chazon Ish, chose, post priori, to recognise the modern a-religious Zionist State of Israel and not to ignore it. From this point of departure, the Chazon Ish and most religious Jews in modern Israel, chose an active engagement with the political system in Israel, so as to influence everyday a–religious life in Israel as much as possible. Chazon Ish argued the formation of religious parties like Agudath Yisrael and Poalè Agudath Yisrael, two parties which adhere strictly to halachic guidelines and follow the normative Torah Authorities. 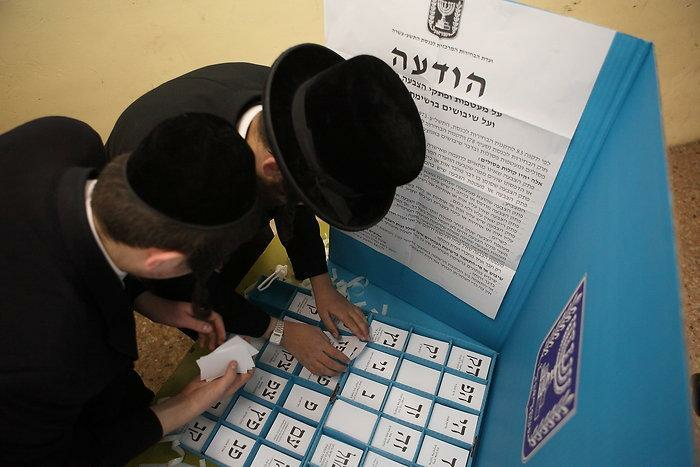 Chazon Ish declared it to be the duty of all religious Jews to take part in the parliamentary elections for the Knesset. In this way the religious parties will represent and defend the interests of the religious people in politics. Examples are: the prohibition of public transport on Shabbat, the prohibition of rearing pigs in Eretz Yisrael, the official prohibition of selling Chametz in all public shops and restaurants during Pesach, an independent religious educational network know as Chinuch Atzamai and Beth Ya´acov at the social level, large amounts of child benefits for large families, the exemption from military service of Yeshivah students and religious girls and women, marriage and divorce according to Halachah, halachic criteria incorporated in law for determining “who is a Jew?” (either born to a Jewish mother or undergoing halachic Giyur-proceedings (conversion)). 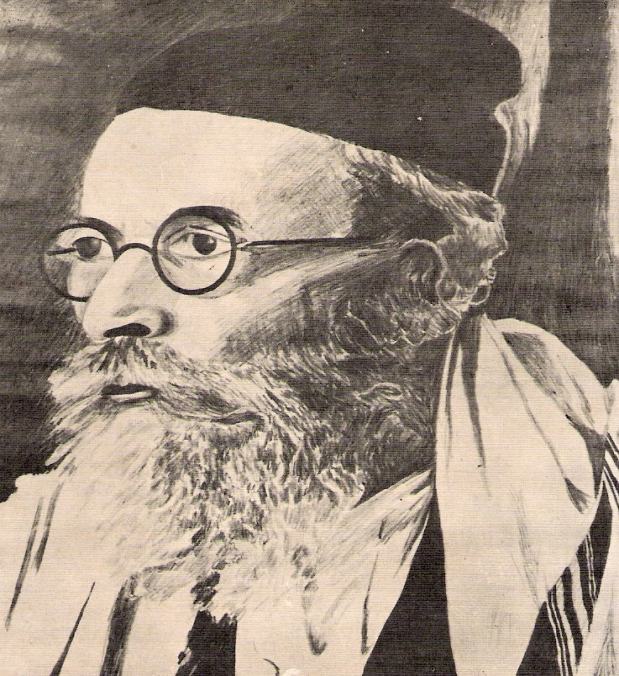 Chazon Ish grew up, developed and learned Torah in Lithuania, the citadel of Talmudic and halachic Judaism, inspired by Rabbi Eliya ben Shlomo, known as the “Gaon of Vilna” (1720-1797 C.E.). 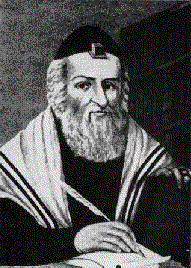 In contrast to Chassidic Judaism under the leadership of Rabbi Yisrael Baal Shem Tov (1700-1760 C.E. 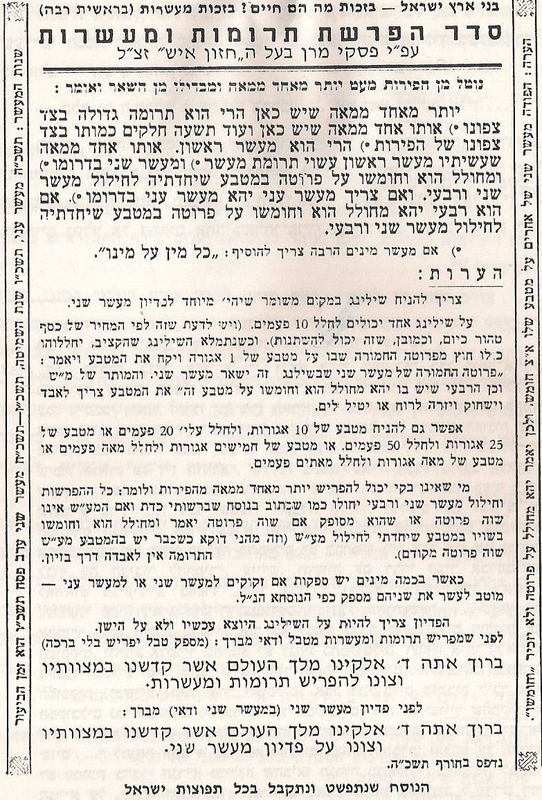 ), who did greatly emphasise prayer as one of the three big pillars of Chassidism, but who did not accentuate the prayer times according to the Shulchan Aruch (Jewish Code of Law), the “Gaon of Vilna” was a proponent of a strict and punctual observance of the times for prayer according to the Shulchan Aruch. The Biblical and Talmudic human lived with nature and did not use watches or clocks, but directed his time according to the position of the moon and stars, sunrise and sunset. Examples are: According to Halachah, there is an exact time after which Shema cannot be said during Shacharit (morning prayers), and also for the completion of Shacharit. This is connected to the start of sunrise. Chazon Ish especially emphasised the reading of Shema at the halachic time of the starting of the shining of the sun (Netz). 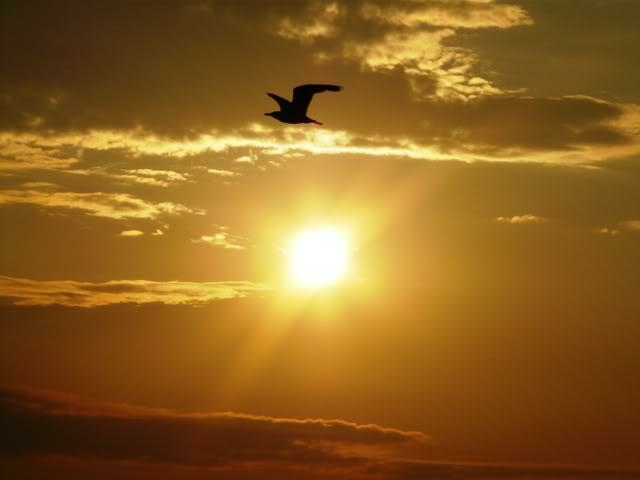 My father told me repeatedly that the Chazon Ish started his morning prayers very early every day, so as to be able to say Shema at the time when the sun begins to shine (Netz). I can remember as a small child starting the Yom Kippur morning prayer together with my grandfather Rabbi Chaim Juda Daum s.z.l. (1889-1965 C.E. ), at 04.30 hours at the brother-in-law of the Chazon Ish, Rabbi Yaakov Yisrael Kanievsky (1899-1985 C.E. 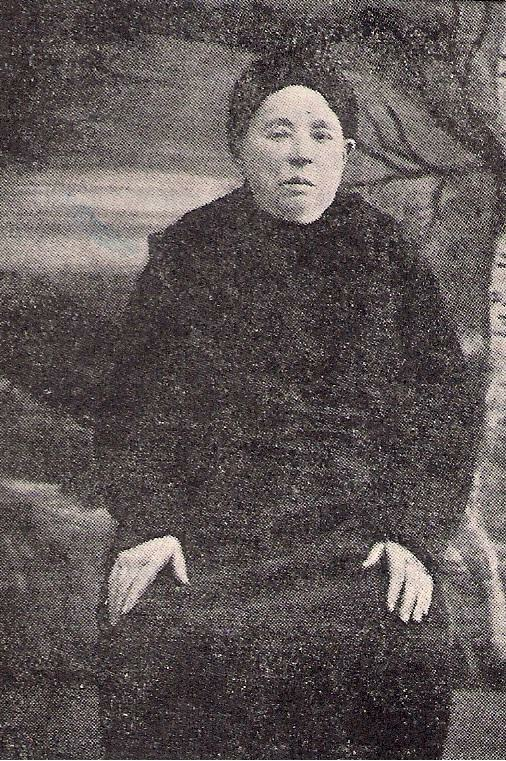 ), known as The Steipler, after his place of birth in the Ukraine. 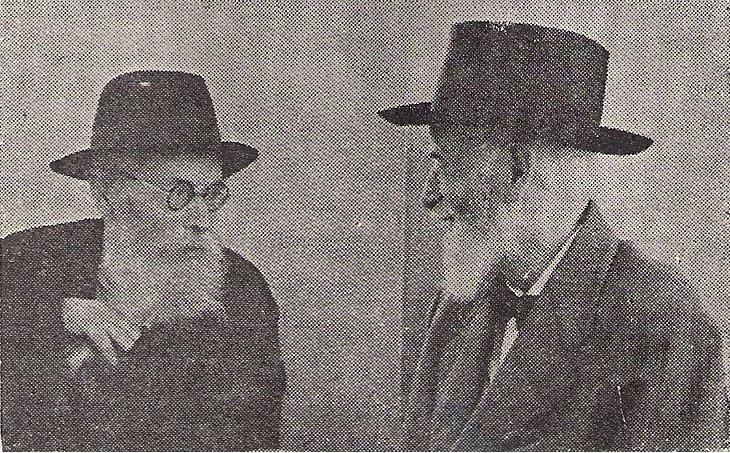 Left: Rabbi Nissim Karelitz Shlita (1926 C.E. 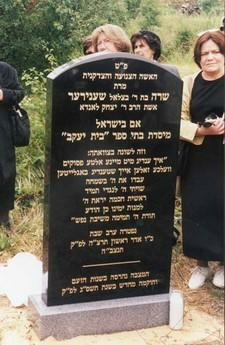 ), nephew of Chazon Ish and son of Rabbi Meir Karelitz z.t.l. 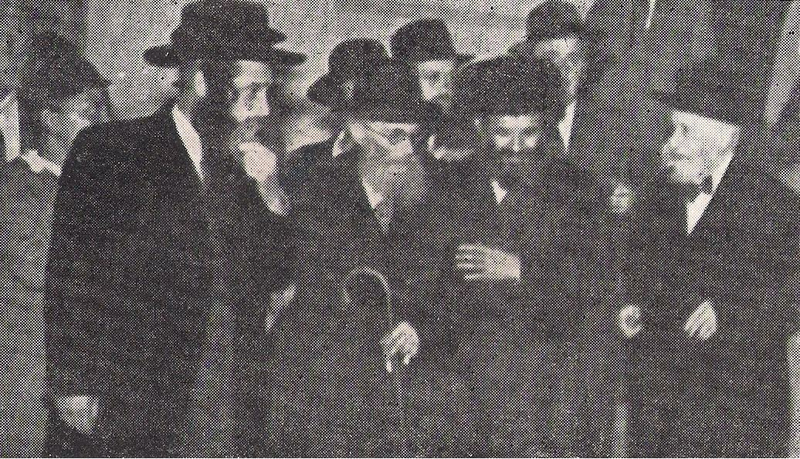 Right: Rabbi Chaim Kanievsky Shlita (1928 C.E. ), nephew of Chazon Ish and son of Rabbi Yaakov Yisrael Kanievsky s.z.l. The future of every people depends on its children and youth. Religious education does not grow in a vacuum. To be able to form children in the religious Jewish way of life, they must get a Jewish religious education. The most important place of learning is the parental home. This however is not enough, as most parents are not pedagogues or trained teachers. A child is influenced by the parents, the environment and especially by the school and the friends at school. Obviously religious Torah-faithful children need a religiously orientated education. The Israeli State has, like every modern European and Western state, instituted compulsory education for all children up till the age of 18 years. The Jewish state schools in Israel however are not religiously orientated, are completely dissociated from the Jewish religious tradition and are not able to provide even a minimal authentic Jewish religious instruction. In the state schools the children are taught the general subjects, superficially a bit of Tenach, Jewish history at a minimal level and the Hebrew language. The state schools lack a deeply authentic education based on Jewish values and are not suited to deliver future religious young men and women. Also the national religious schools, which have a higher level of religiosity to dispose of, lack the excellence in Jewish subjects like Tenach, Mishnah, Talmud, … and are satisfied with mediocrity. These schools also have the problem that they are mixed. Boys and girls together in one school, is halachically unacceptable from a certain age upward. One can only state with regret that most graduates of these schools are non-religious. Both these networks of schools are influenced by the State of Israel and the non-religious Ministry of Education, which subsidises these schools and thus also dictates the educational programme. Chazon Ish argued for an independent, self-supporting, religious, Orthodox educative network of instruction, in the long tradition of Agudath Yisrael, founded by the Chafetz Chaim (1838-1933 C.E.) 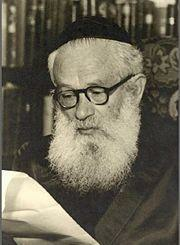 and Rav Yakov Rosenheim (1870-1965 C.E.). For the education of boys a religious Charedi network of schools has been established with the name Talmud Torah Chinuch Atsmai. 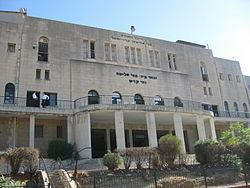 In these Charedi schools the accent is on an authentic religious instruction, which means that the largest part of the school curriculum is dedicated to religious subjects like Torah with the classical commentaries and Mishnah and Talmud at the highest level, which prepares the youngsters for the Yeshiva. Other relevant Jewish subjects are also taught, like Jewish History from a religious perspective, Hebrew grammar and obviously Halachah. General subjects are taught rudimentarily, according to the minimal demands of the government authorities (basic mathematics, basic language skills, basic English). Most of these pupils study for eight years without any secondary education, but continue their studies immediately with the Yeshiva. 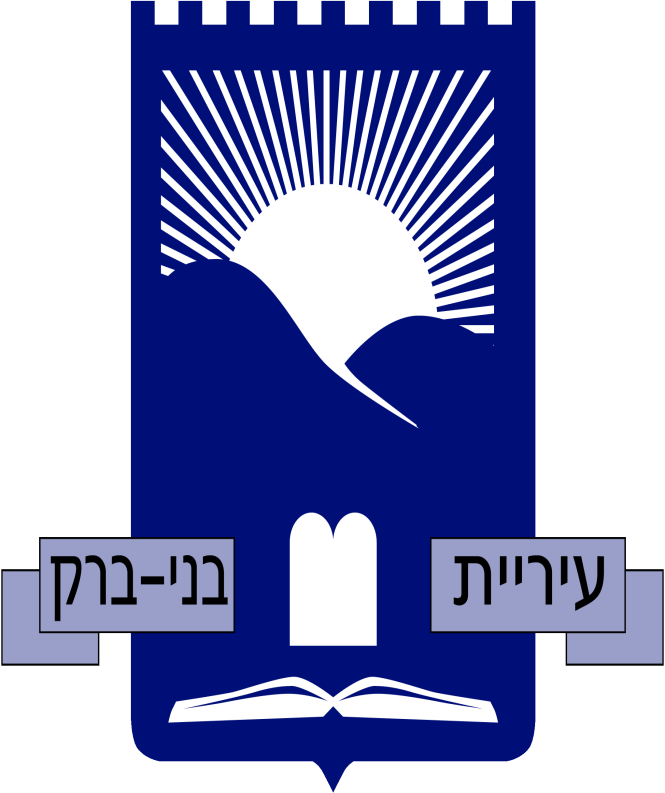 Naturally a high level in Jewish religious studies is acquired through this method of learning, but the other side of the coin is that these graduates are without any prospect of finishing a university degree or other form of higher education, because they have not had any secondary education. This severely limits the prospects for a job. For Orthodox girls an educative network was founded named Beth Ja´acov, which goes back to a pre-Shoah tradition. 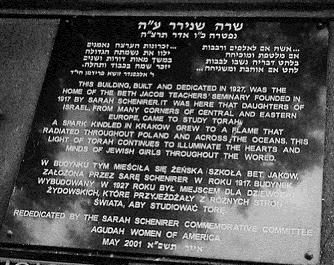 Mrs. Sarah Schenirer (20th century) established the first Beth Ja´acov school in Krakow, Poland, with the blessing of the Chafetz Chaim and Rav Yacov Rosenheim. Sarah Schenirer was a very pious and learned lady, very much aware of Jewish ideas and inspired with the ideal that Jewish girls also needed a religious and general education to guard against assimilation and to immunise them against profane Jewish society. 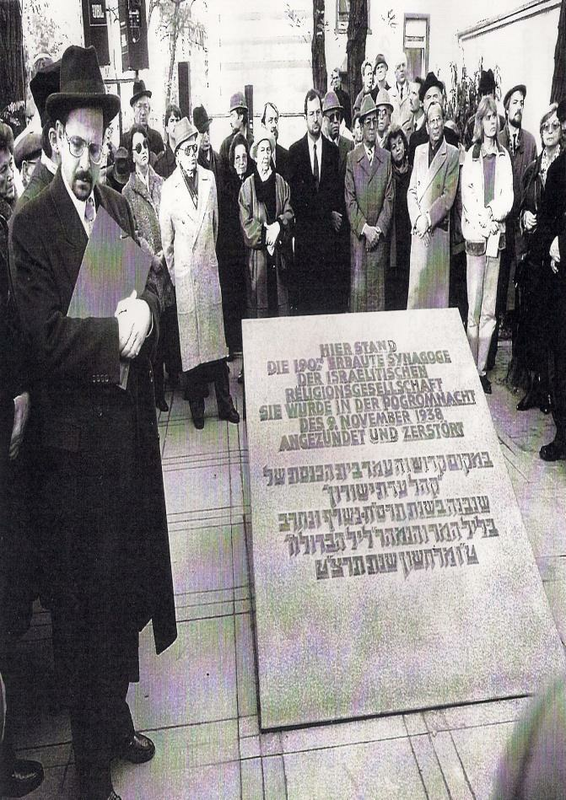 Right: Commemorative stone on the building of the Beth Ya´acov building in Krakow, Poland, not destroyed by the Shoah. Another aspect that was important, is that future fitting partners for the Yeshiva students also had to be provided for. In these pre-Shoah schools a very high level of religious instruction was accomplished. These schools were the model for Chazon Ish and the Agudath Yisrael leaders to expand this tradition and apply it to schools for boys. 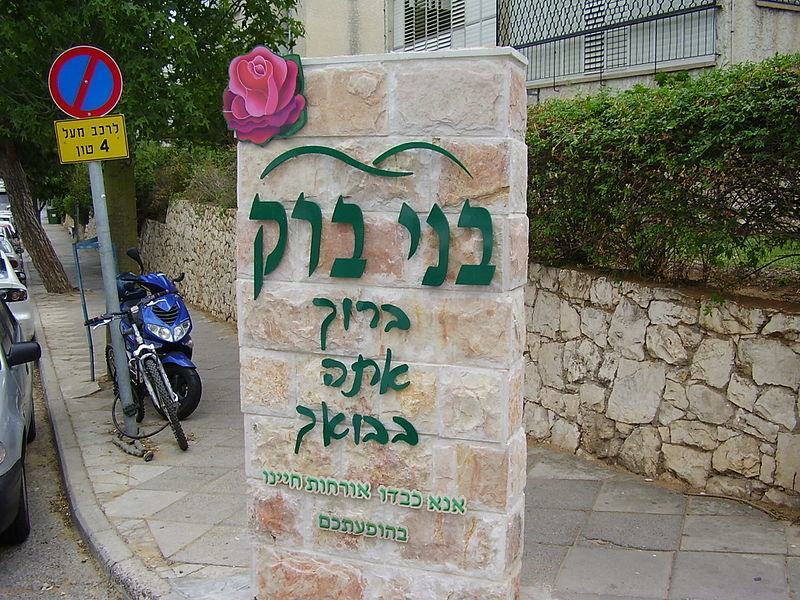 The Orthodox Beth Ja´acov network of schools is widely dispersed among Jewish religious centres in Israel, but also in the Diaspora. Unlike the religious education of the boys, the girls finish their schooling after twelve years with a certificate in secondary education. Very few of these girls however start to study for a university degree, as they mostly continue with a Beth Ja´acov seminary where they gain more in-depth religious Jewish knowledge, with the aim of working in a Jewish school, at whichever level. One can determine at a critical glance that the religious network that Chazon Ish established with other Orthodox leaders, is a completely independent network. This means that for the major part the network is unsubsidised. This however causes this sort of education to be expensive and selective. Another point of criticism is that the level of general instruction leaves much to be desired and that the chances of finding a job remain very limited. 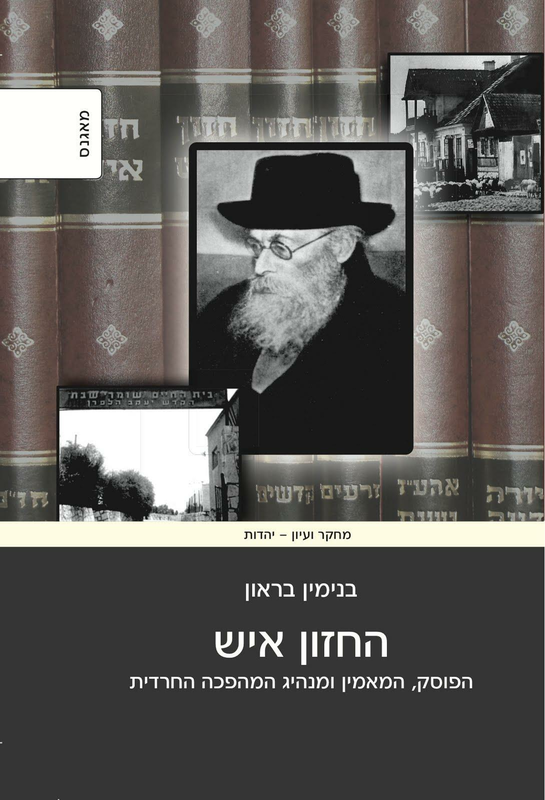 The Chazon Ish can be considered a pioneer in the area of halachic education concerning the agricultural Mitzvoth of Eretz Yisrael. Due to the exile of about 2000 years, the Jewish People had lost its connection to agriculture and the earth. From a People originally of farmers, firmly rooted in the Land of Yisrael and the Mitzvoth of the Torah, our People have become mainly traders, scientists etc. Little feeling for agriculture remained. A big change occurred during the past 150 years, with the gradual return, under the influence of Zionism, of many Jews to Israel. The Zionist movement considered it an ideal to engage those Jews returning to their original home more strongly with agriculture and so create a new type of Jewish human, a Jewish human who could renew his/her experience of being connected to the earth. 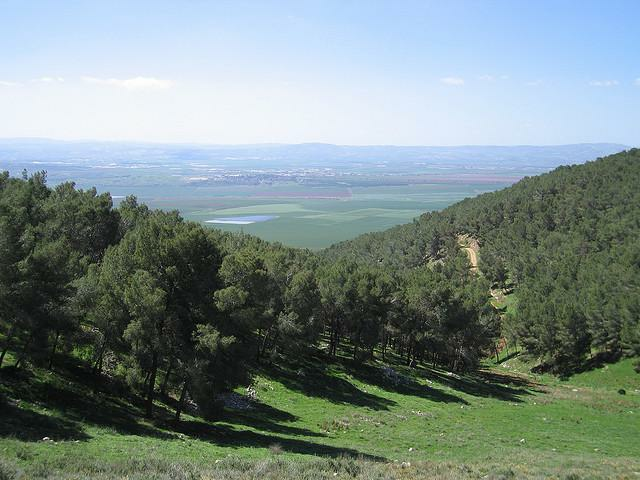 The Zionist movement acquired great merit in this area by establishing tens of Kibbutzim and Moshavim (communities of farmers). The Land of Yisrael thus turned from being a wasteland into a green oasis. Under this influence a metamorphosis also occurred on the religious level. Slowly national religious Jews as well as Orthodox Jews started their own colonies, which distinguished themselves by practising the agricultural Mitzvoth. A large problem arose, because these practises had not been applied for the past 2000 years and only theoretical knowledge on these subjects existed. All kinds of questions on the Shemitah year, the Shabbat year, Terumah (part set aside for the Priests), Ma´aseer (part set aside for the Levites), Orlah (no enjoyment of fruits for the first three years) etc. arose and they were terra incognita for most farmers. All these Mitzvoth apply only to Eretz Yisrael. The first big controversy concerned the Shemitah year. The first religious farmers started their colonies around 100 years ago, and when the Shemitah year came around, they were confronted with their unfamiliarity with its laws. They did not know whether to leave the land to lie fallow for a year, as the Torah commands, with the possibility of an enormous loss ensuing, or whether to postpone this till later, so as to further the construction of the Land. For a solution to this problem they first turned to the then very well known Rabbi from Jaffo, Rav Avraham Yitschak HaCohen Kook (1865-1935 C.E. 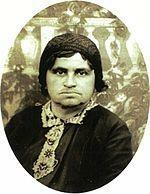 ), who would later become the first Ashkenasi Chief Rabbi of Israel. Rav Kook based his opinion on the existential threat to the religious farming pioneers, that if they were to leave the Land fallow, this could turn out disastrous for them. In his solution he suggested temporarily selling the Land to non-Jewish people during the Shemitah year (an idea parallel to the selling of Chametz during Pesach), thus halachically enabling the farmers to continue working the land, as the earth legally belonged to non-Jews. Many Kibbutzim adopted this solution, but not Chazon Ish or the Orthodox farming colonies. Chazon Ish demanded the uncompromising fulfilment of the commandment of Shemitah according to the original meaning in Torah. His reasoning was that we must accept a high standard, also in agriculture, and trust in G´d that HE would not abandon the pious Mitzvoth practising farmers. To further this, Chazon Ish set up a fund to financially support these farmers. Religious farmers can still these days obtain financial support during the Shemitah year. 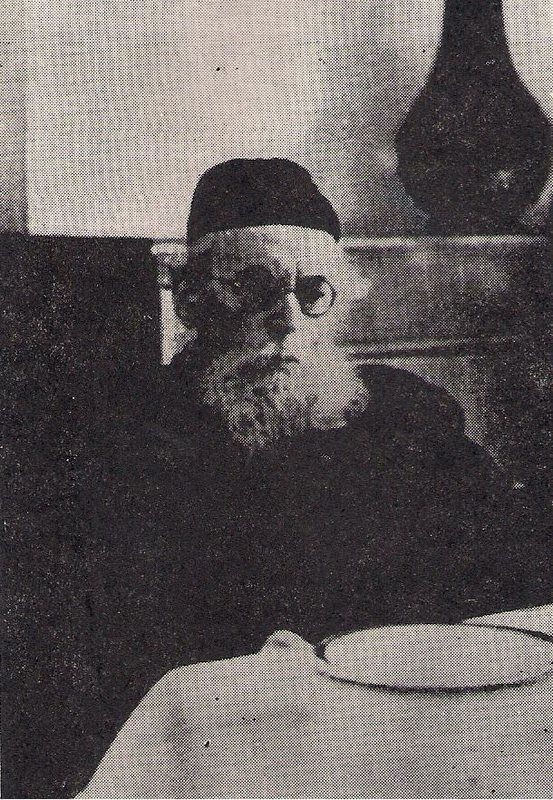 Chazon Ish is considered the most decisive halachic authority in the field of Mitzvoth connected to the Holy Land. It was Chazon Ish who reinstituted and gave concrete instructions for the fulfilment of the Mitzvah of Terumah (the levy for the Cohanim/Priests) and the Mitzvah of Ma´aser (the levy for the Leviim/Levites). In most Siddurim (prayer books) one can find how these days, when there is no Temple, the Rabbinic duty of separating Terumah and Maaseer must be done according to Chazon Ish. Many new editions of the Kitsur Shulchan Aruch (the concise Jewish Code of Law) devote a section to these Mitzvoth connected to agriculture in Eretz Yisrael. This section of the Kitsur was compiled by Rabbi Kalman Kahana s.z.l. (1910-1991 C.E. ), a close confidante and follower of Chazon Ish, and also the founder of the Kibbutz Chafetz Chaim and chairman of the religious Orthodox party Poale Agudath Yisrael. This party was a pioneer in the establishment of Orthodox Moshavim and Kibbutzim. These Moshavim and Kibbutzim applied the guidelines of Chazon Ish on the agricultural Mitzvoth. 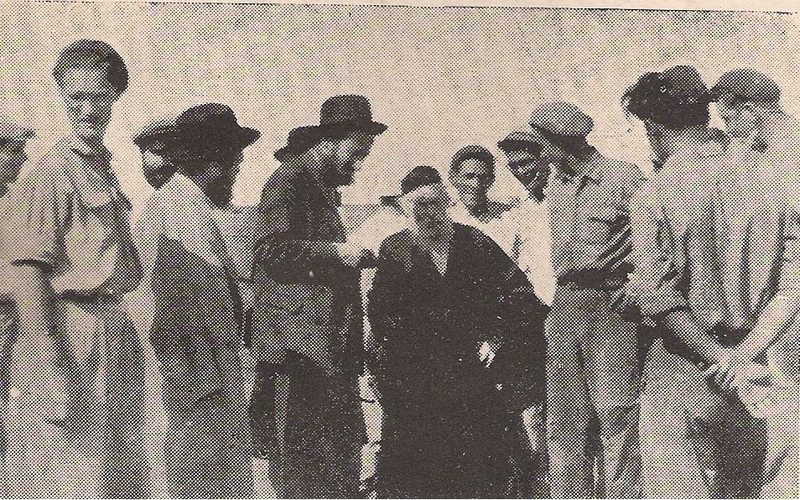 The national religious Moshavim and Kibbutzim, as well as the Chief Rabbinate of Israel, department of agricultural interests, accepted many guidelines of Chazon Ish on agricultural Mitzvoth. The teaching of Chazon Ish in this specific domain has also been generally accepted. 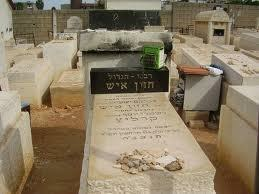 Noteworthy is the simplicity of the grave stone and especially that no Ohel (mausoleum) has been made over the grave. This is in marked contrast to the Chassidic movement where every unknown Rebbe has a beautiful mausoleum on his grave. Surely the words of Micah are relevant here. A true lesson for all of us to live humbly, but also to die humbly. Also thanks to his engagement in all areas of religious life, Eretz Yisrael has today become an important religious centre of the Jewish People. 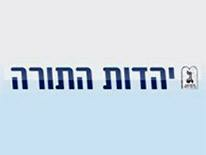 What is the current message of Chazon Ish for us? We live at the beginning of the 21st century. We are spoiled with all sorts of technical and ingenious gadgets and innovations, but in reality we are very poor spiritually. Most of us are lonely and alone. The world that surrounds us is perceived as sterile, is full of violence and even the material world, which for many is the idol of money and mammon, has been eroded by the economic crisis. Chazon Ish lived surrounded by the most basic of circumstances. He put no value on luxury. His loved Torah and its practise. Torah gave purpose to his life, gave inspiration, warmth, humanity and the moral strength to bring the ship of religious Judaism to a safe haven. 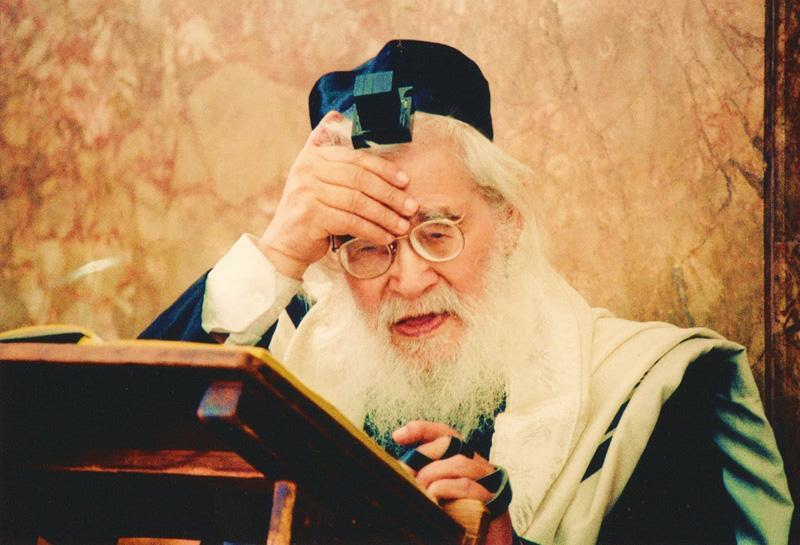 No one can today reach the level of great learning combined with the enormous spirituality of Chazon Ish, but in his love for Torah, moral values and pioneering in the field of Torah and Mitzvoth, Chazon Ish is a model for all of us.